Clearly indicated as “crew only”, please do not enter “No go” areas or the bridge without the permission of the cruise director. Jahan Cruises operate an open bridge policy but ask that you be considerate to the ship’s officers’ duties. The dress code on board and ashore is informal and relaxed. In the day time, feel free to wear comfortable casual attire. In the evenings, smart casual would be appropriate. Flip flops are provided for your comfort. When on-shore, guests should use comfortable non-slippery footwear. During certain seasons, the river banks and paths can be muddy. Thus, Jahan Cruises request that you take off your footwear when returning on board so that we can clean your shoes and return them later. 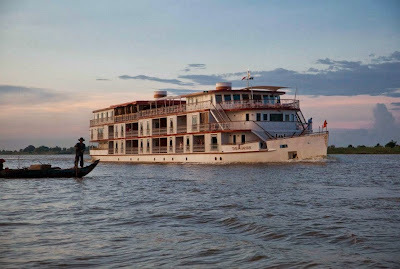 Due to heavy winds, especially on the Tonle lake, the ship can be a bit rocky. Please remain calm.